Who doesn’t love a good discovery? It’s what dreams are made of … you know, the proverbial diamond in the rough or a glorious fountain of oil in the middle of a desolate wheat field. You get the picture. Redbooth has a discovery for you in the form of Paydirt and a new application programming interface (API) that helps you log your team’s billable hours across multiple clients, projects and tasks, and generate an invoice from it without keeping any spreadsheets or doing a single copy-paste. Eureka! When Redbooth opened up the new (API), the team at Paydirt time tracking jumped on the opportunity to get their tools working together. 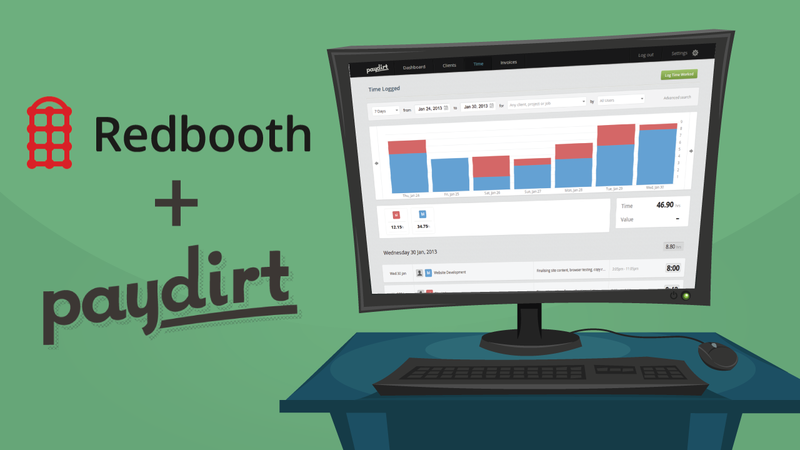 And the pressure was on — Paydirt users were already insisting on a Redbooth integration. They literally demanded it! Paydirt’s new integration with Redbooth lets you track time on tasks from right within your Redbooth projects, and allows project leaders to turn that billable time into helpful reports and sleek invoices for clients in no time. Paydirt’s billing automatically keeps track of project budgets, has flexible options for how your time is billed (client rates, different rates for each users or fixed project prices) and has reporting to see exactly where your team is spending their time. Inside Redbooth, Paydirt shows the amount of logged time on each task, and lets you add a time log or start a timer ticking in one click. “At the heart of our company’s small business management strategy, methodology, and tool-set, for both in-house and client side collaboration, is Redbooth – our enterprise and project management solution of choice. And now with the advent of this brilliant solution from Paydirt we have a feature rich, seamlessly integrated, and user-friendly project time tracking and client invoicing solution. To get started, grab the Paydirt time tracking extension for Google Chrome, and connect your Paydirt and Redbooth accounts from Paydirt’s integrations panel. Everything else can be done from within Redbooth!